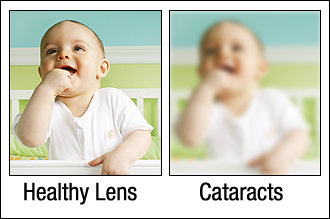 A cataract is a gradual clouding of the natural lens inside your eye. This causes blurry vision, increased glare and a decrease in overall contrast. Most cataracts form due to a normal aging process of the eye. Other causes include: diabetes, UV exposure, and the use of certain medications. Cataracts will affect both eyes, with one eye usually preceding the other. With our state of the art lens implants, cataract surgery can offer improved vision as well as an increased independence from eyeglasses. Our office provides easily accessible cataract surgery for everyone in the San Francisco area. Here at Goodman Eye Center, we want all San Francisco patients in need of cataract surgery to feel comfortable and informed about what cataract surgery entails. We invite you to read through our resources, and call our San Francisco office with any questions or concerns involving your cataract surgery. With advancements in medicine, cataract surgery performed by Dr. Daniel Goodman in San Francisco is one of the most common and non-invasive procedures performed. During cataract surgery, the natural lens is removed from the eye and replaced with an artificial intra-ocular lens (IOL). Patients undergo mild sedation and topical eye drops. Dr. Goodman makes one small incision and uses an ultrasonic probe to break up the natural lens. The implant lens is then placed inside the eye to provide optimal vision. We strive to provide the best cataract surgery here in San Francisco. At Goodman Eye Center, we will work with you to make sure you are getting the best individualized care possible. Every pair of eyes is different, and we keep this in mind when preparing for your cataract surgery. Dr. Daniel Goodman, who has performed numerous cataract surgeries in the San Francisco area, will make sure you are getting exactly what you need from your cataract surgery. Premium Lens Implants: What type of lens implants should you use for cataract surgery? During cataract surgery, the cloudy lens of your eye is removed and replaced with a clear lens implant. As mentioned earlier, you will need to discuss with your doctor what type of lens implant you want and need in order to determine optimal vision after cataract surgery. Patients who are having cataract surgery now have an option of monofocal lens implants for seeing at one distance only or multifocal (also called premium lens implants) that enables vision at near, far, and intermediate distances. Our cataract surgeon Dr. Daniel Goodman, located in San Francisco, will help you determine what lens implant type would be best for your vision. Results can vary but most people have excellent results. Within the first day of cataract surgery it is very important not to rub or press on your eye. It is common that you will have some itching, tearing, and mild discomfort. 1. It is normal to feel head grog from the local anesthesia after cataract surgery. The effects will wear off relatively quickly but do not be alarmed. 2. Our eye doctors are going to take precautions to prevent infection so they will place anti-inflammatory drops to minimize swelling. 3. As previously mentioned avoid bumping or touching your eye after cataract surgery. 4. You may see some initial glare and haloes after cataract surgery but this should go away over time. 5. You are not allowed to drive so be sure to have someone in place to take care of you. Make sure you get all of your prescriptions filled so you do not have to suddenly have to leave your home. 6. Our practice will provide you with instructions for the prescription medications.